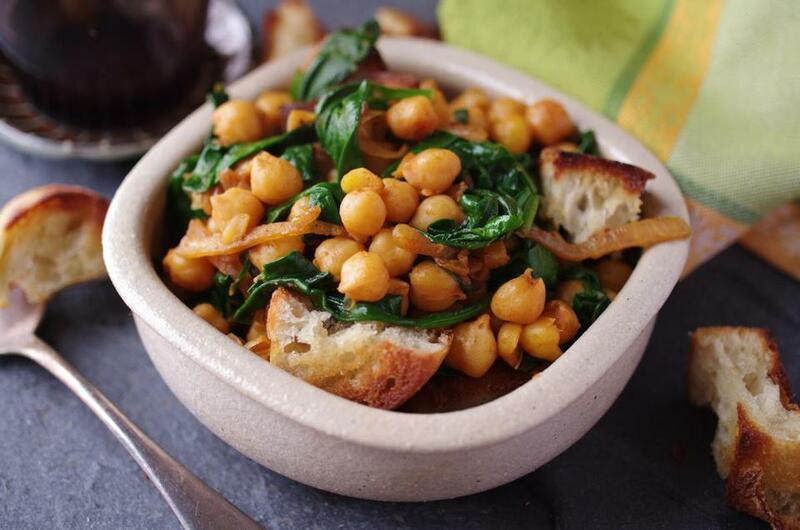 Spanish smoked-paprika chickpeas (the protein- and fiber-rich legume native to the Middle East) with spinach. Dried chickpeas, soaked overnight, typically take less than 20 minutes to cook and have a dreamy texture. If you want to use canned chickpeas in this recipe, use two cans (about 16 ounces each). In the Andalucia region of Spain, writes Jeff Koehler in the book “Spain: Recipes and Traditions From the Verdant Hills of the Basque Country to the Coastal Waters of Andalucia,” spinach and stewed garbanzo beans (as they’re called there), are popular tapas fare. Traditionally, crusty bread is pounded with toasted garlic to make a paste, which is stirred into the dish. Here, croutons of sauteed bread add a nice texture to the finished dish. 1. Rinse the chickpeas and transfer to a large saucepan. Add a large pinch of salt and enough water to cover them by several inches. Bring to a boil, skim the surface thoroughly, and lower the heat. Simmer the chickpeas for 15 to 20 minutes or until they are tender but not falling apart. Drain into a colander; do not rinse. 2. Meanwhile, in a flameproof casserole over medium heat, heat 2 tablespoons of the oil. Add the bread and cook, tossing constantly, for 3 minutes or until it begins to brown. Remove from the pan. 3. Add the remaining 2 tablespoons olive oil to the pan. Add the onion and cook, stirring often, for 10 minutes or until it browns. Add the garlic and cook 2 minutes more. Stir in the smoked and sweet paprika and cumin. Cook, stirring, for 2 minutes. 4. Add the chickpeas and cook, stirring often, for 2 minutes or until they are coated with seasonings. 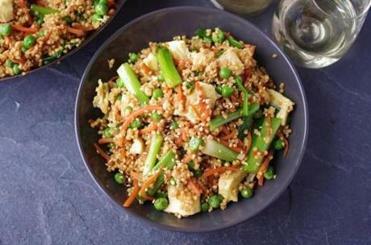 Staples from around the world can make familiar dishes more interesting — and healthful.